Additional scoring games can be played in a round to increase the fun. In order to spice up a round of golf or to add additional competition, a variety of “games within the game” can be played. These games can be played for wagers or for fun, and they will not disrupt the rules of a typical golf game. They can be played regardless of experience or skill level. To play this game, each player is assigned an initial score based on his handicap. For example, a scratch player might be assigned a minus-40, a one-handicap player would be assigned a minus-39. 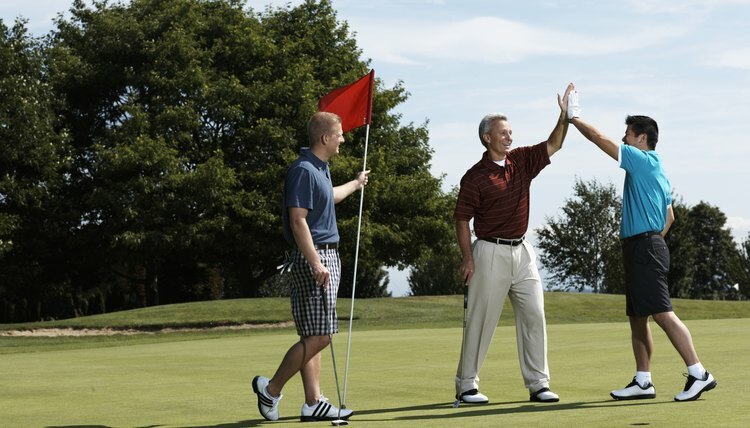 As the game progresses, each player is awarded positive points based on certain scores, such as two points for a par and four points for a birdie. The player with the highest positive score or lowest negative score is declared the winner. Scruffy allows a player to make the most of a bad tee shot. For example, if the player’s tee shot lands in a sand trap, he can call a “Scruffy.” He and the other players in the group wager a dollar. If the player makes a par for the hole, he would collect from the other players. If not, he would have to pay each of the other players a dollar. This game is played with multiple foursomes. Each foursome plays with one pink ball, with Player 1 using it on the first hole, Player 2 using it on the second hole, and so on. The winner is the foursome that has the lowest combined score while playing the pink ball. If the pink ball is lost in the water or in the woods, that team is disqualified. Players have the opportunity to earn points based on three separate criteria on each hole. The first player to land a ball on the green earns a point (bingo), the player whose ball is closest to the pin after all balls are on the green wins a point (bango) and the first player to hole out wins a point (bongo). The winner is the player with the most points at the end of the round. To ensure competitive balance, players should rotate teeing off first on each hole.